Sports fans with disabilities are often grossly overlooked and undermined when accommodation and ticket prices are chiefly concerned to view live sporting events. In turn, fans with disabilities have been discriminated against and have been turned a blind eye to by the mainstream media and professional sports fans at large. Disabled fans have a voice and are highly entitled to experience live sports action unlike any other fans, particularly with excellent access upon entering and exiting the arena and/or stadium, whilst experiencing the sporting event with full satisfaction without a fear of harassment, discrimination and/or intimidation. "For too long in this country, disabled sports fans have been treated like second-class citizens at many sporting venues. And yet one in five of us have an impairment, and disabled people and their households have a spending power of over £200 billion" Minister for disabled people Mark Harper said. Sports fans with disabilities range from those with hearing and visual impairments, being in a wheelchair, coupled alongside chronic forms of illness which affects disabled sports fans on a daily basis such as cystic fibrosis, cerebral palsy, autism, paralysis, individuals who require sign language and amputees to name a few. "We know the situation in football is unacceptable and it's not only wheelchair access that falls short, but adjustments for people with all kinds of impairments. 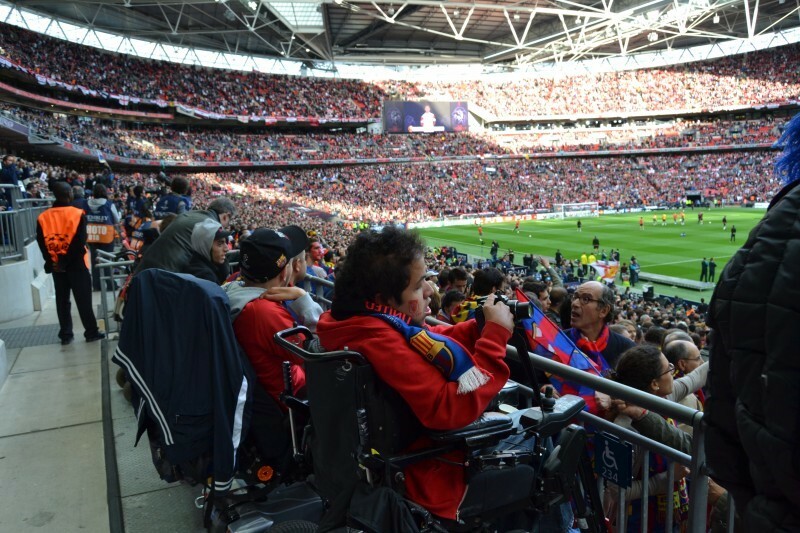 We encourage all sports fans with a disability to tell us of their experiences at sporting venues, so we can get a clear picture of whether disabled sports fans are being treated fairly." Harper added. In contrast, professional sports teams offer full hospitality, professional assistance, safety and stewarding for sports fans with disabilities, which is evident with various ramps and accessible doors for wheelchairs, additional space for disabled fans within the disabled bay within the stadium, coupled alongside disabled fans being catered to with food and refreshments within the stadium. In addition, travelling disabled fans and disabled fans of the away team are also shown hospitality and excellent customer service, thus being navigated throughout the stadium; a contemporary stadium has many blocks and sections from the exterior and the interior has many steps and tiers which can prove troublesome. The exterior of the quintessential contemporary stadium is often large although the interior of the stadium itself will appear relatively closer. 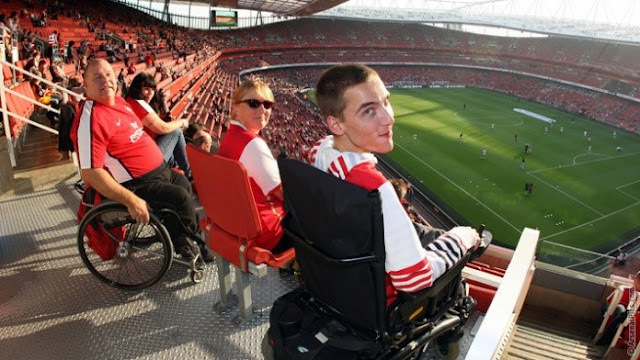 However, contemporary stadiums have various paths and doors and often prove problematic for those with poor co-ordination skills, functional disabilities and disabled fans who are in wheelchairs. In addition, senior citizen disabled sports fans as senior as 90 years old often attend games with regularity and will have to exit the stadium prior to the end of the contest in order to not be part of a herd of thousands of fans attempting to leave the stadium in a hurry; nearby roads are closed and iron protections barriers patrolled by stewards and police officers are implemented to ensure that disabled fans leave safely. Furthermore, disabled sports fans will need to be aware that trouble could potentially ensue and therefore be vigilant; some professional sports teams hire over 3,000 stewards to facilitate the event safety and there are disability assistants and disability liaison officers who also handle affairs before and after the contest. Sports fans with disabilities have a designated parking lot which is exclusively for them and their carer and family, whilst tickets can be purchased on the date of the contest if tickets have been purchased in advance. Contemporary stadiums such as the London Stadium in Stratford, London Borough of Newham have ticket offices which open at 9am during home games during the weekend. In addition, stadiums have numerous corporate and hospitality offices inside which provide information and customer service for disabled fans and non-disabled fans; sports fans with disabilities can experience guided stadium tours and marvel at the history of the teams trophies and view the field up, close and personal. 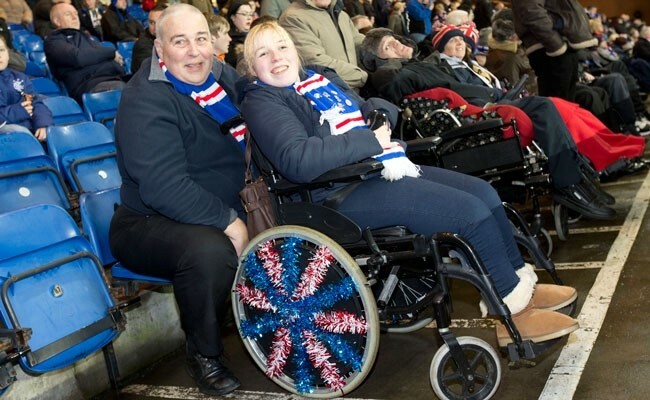 Furthermore, disabled sports fans carers can also liase with the team for travel accomodation. Sports fans with disabilities live with severe complications on a daily basis and visiting their favorite sports team highly alleviates the harsh realities of daily life and places a broad smile on their faces. Moreover, experiencing a sporting event for a disabled sports fan also provides a very healthy social outlet and they will often meet new friends and acquaintances along the way due to like-minded interests. Ultimately, disabled sports fans are unequivocally the most clean hearted, humble and supportive fans who soak in the experience of live sporting action opposed to fair-weather, fickle fans who pay the admission to criticise their own team. The goals of stadium access for disabled sports fans needs to be firmly addressed at large in order to eradicate the ignorance and pomposity which has plagued a nation. Disabled sports fans have reached the proverbial halfway line although they now await the elusive goal of equality and greater access universally.